Morongo Casino Resort & Spa sits just west of the Palm Springs area in the base of the picturesque San Gorgonio and San Jacinto Mountains. Guests are treated to views overlooking a 32,000 Morongo Indian Reservation and vistas of the Banning Pass. The California Indian casino has the distinction for being one of three casino resorts in the state of California with the prestigious AAA four diamond casino resorts in California. On the premises is a 27 story landmark hotel complete with 310 rooms and 32 suites. The shinning star element by far is the over 150,000 square feet of fast-paced, high stakes gaming action that takes place 24 hours a day, seven days a week for every day of the year. This fact alone makes Morongo the largest gaming floor facility on the west coast of the country. The casino is considered by many to be the Las Vegas of the west. In all there are 75 gaming tables featuring the popular card games of Texas hold ‘em, Blackjack, 4-card poker, 3-card poker and much more. Each gaming table features personable dealers who are patient with new players learning the games and old friends to many regular players who grace the tables each day. Dealers are among the most professional in the casino industry. A main cashier area is available for gaming deposits or a security measure if guests prefer. The gaming deposit feature provides guest with the ability to draw from the account as needed anytime during play. These deposits are accessible at the pit or main cashier areas. Money deposited for security reasons is only accessible at the main cashier area. Poker play at the casino gets underway around the clock in a separate 22-table poker room located just off the main gaming floor. Here guests are afforded the opportunity to take lady luck for a ride and hopefully walk away with a fatter wallet to show for it at the end of the night. Features include some of the hottest poker games known to man are showcased in this upscale poker room. Popular table games showcased on any given day of play include Texas Hold ‘em, No-limit Texas Hold ‘em and 7 card stud. Dealers in the poker room go to great lengths to ensure the highest standards of poker play are upheld as each hand is dealt. At any given time during play at a gaming table there is an additional chance at a cash reward given. When a player receives a natural royal flush with both cards in hand, that player earns a spin on the prize wheel. Here there is up to $250 cash and other prizes available. To be eligible the hand must be verified by a floor supervisor. 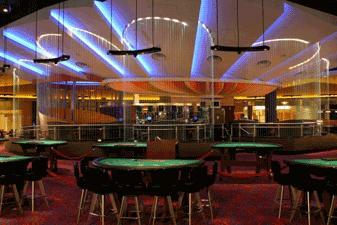 In addition to the poker room gaming tables, Morongo hosts a variety of daily poker tournaments throughout the week. Each tournament is open to the first 100 players that register. Any player participating in one of the many live games at least 2 hours before a tournament begins is given preferential treatment for that day’s tournament event. Tournament action gets underway bright and early at 10:00 am on Monday morning with a 5-card Omaha Tournament. This is a $750 guarantee with a $30 buy in fee. In addition to this tournament there is a no-limit Texas hold ‘em tournament the first thee Mondays in June at 7:00 pm. It is a $2,000 guarantee. To qualify for this tournament you need to buy in for $5 and earn earn 15 hours in live play in the casino. Tuesday tournament action kicks off with a No-Limit Texas Hold ‘Em tournament at 10:00 am. This tournament has players battling for the $1,500 guarantee by paying a $30 buy in fee. The day comes to an end with another No-Limit Texas Hold ‘em tournament at 7:00 pm. The stakes are higher with a $3,000 guarante. This late evening poker tournament requires a $55 buy in and additional $5 entry fee for each player. No-limit Texas Hold ‘em is the name of the game as tournament play gets underway on Wednesday. Starting at 10:00 am there is a $1,500 guarantee No-limit Texas Hold ‘em tournament starting with a $30 buy in. Play continues with a smaller No-limit tournament at 7:00 pm. Entry fee is 5 dollars and re-buy options are available. The weekday tournaments come to an end with two more no-limit Texas Hold ‘em tournaments on Thursdays. At 10:00 am there is a tournament featuring a $1,000 guaranteed prize pool. The buy in fee is 30 dollars. That evening an additional hold ‘em tournament kicks off at 7:00 pm. The stakes are a little higher as players stand to walk away with a nice portion of a $2,000 guarantee. There is a $55 buy in and $5 entry fee. For this tournament there is a three table minimum for tournament play to carry out. In addition to the specific daily tournaments the casino also holds instant cash giveaway moments through the day as well. Each Monday and Wednesday there is a double jackpot giveaway for table games between the hours of 12:00 pm and 12:00 am. Rack attack giveaway adds $100 to selected table games between the hours of 6:00 pm and 12:00 am. In between those two no-limit tournaments there is an additional bonus tournament feature to events on Tuesday and Thursday. Starting at 11:00 am and running to 6:00 pm the casino plays a high hand of the hour tournament. $100 is handed out each hour on Texas Hold ‘em games and $50 per hour is given for 7-card stud and Omaha poker games. A chance for big money comes between the hours of 6:00 pm and 12:00 am where the casino hands out a $50,000 jackpot every even hour of that time period. As the weekend arrives no-limit Texas hold ‘em action kicks into high gear. Friday morning starts at 10:00 am with a $2,000 prize tournament with a $40 buy in and $5 entry fee. Play continues at 11:00 am with a $3,000 guarantee prize game with a $50 buy in and $5 entry fee. No-limit Texas Hold ‘em play comes to an end with an 11:00 am tournament Sunday morning that has a $1,500 jackpot with a $5 entry and re-buys options available. Morongo takes No-limit Texas Hold ‘em play to a whole new level on June 30, 2008. Taking center stage at 7:00 pm is a high stakes No-limit Texas Hold ‘em tournament with a $10,000 guaranteed prize pool. Entry is limited to players that earn 30 hours of live play at various gaming tables anytime from June 1st to June 30th. The buy in fee is $30 as well. Once that initial 30 hours of play has been logged, players will start to earn tournament chip benefits. For each 10 hours of play above the original 30 hours, a player will receive $1,000 in tournament chips. The maximum amount that any player can earn is $9,000 for 70 hours of live play. 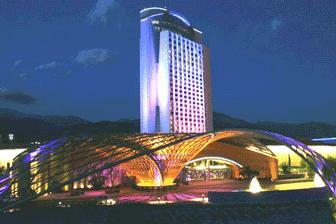 Morongo is host to a World Series of Poker satellite tournament. The next occurrence of this event is Sunday, June 8th at 2:00 pm. The buy in fee is $200 with an additional $25 entry fee which makes a player eligible for the $2,500 cash prize and seat in the next World Series of Poker main event. Each level of tournament play is 30 minutes in duration with the last 10 seats earning a cash prize. The limit of gaming tables involved in play is set at 14. Morongo exhibits tasteful décor that welcomes players to come enjoy the variety of amenities that can be found inside the front doors. Players are afforded window views to the surrounding desert area which creates a subtle, soothing gaming environment. 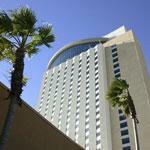 Recent renovation efforts took advantage of nearly every inch of the 27 story tower hotel and adjacent gaming area. Bright lights lead the way towards all the action that can be found inside and outside the facility. An outdoor pool area is blanketed with palm trees while inside the gaming tables are filled with vibrant non-stop action around the clock. Restaurants and bars come roaring to life offering vibrant chances to take a break from gaming activity. Inside the gaming area players can gain a lay of the land with a stop at The Pit Bar. Views from this vantage point overlook the entire gaming floor. Grab a bite to eat at one of two eateries right off the playing floor with a selection of snacks and other menu items 24 hours a day. Marongo features a variety of reasons why it is the best of the best in California gaming facilities. The location affords it the luxury of being easy accessible from virtually any point in California. Driving distance is mere miles from places like Los Angeles International Airport, Palm Springs and Ontario. Parking facilities are readily available as well with self parking, covered parking and valet parking available. The legal gambling age at Morongo is 18 while the legal drinking age remains at 21. With so much gaming action taking place around the clock, Morongo Casino Resort & Spa is well worth the effort to walk through the front doors. If you are an online poker player, we recommend that you use the best referral code full tilt to get a bonus on your first deposit at fulll tilt poker. Full tilt offers a generous bonus compared to other rooms like stars were bonuses are capped at 50 dollars. This entry was posted on Sunday, June 8th, 2008 at 11:40 pm	and is filed under California Poker, Online News, top casinos. You can follow any responses to this entry through the RSS 2.0 feed. You can leave a response, or trackback from your own site.